then, I had to wait until they were released to show my card. I love my Mom's Images...I love to color them!! This card I made for my Mom. She had to run some errands on a really really hot day. I made her some Ice Tea and had it waiting for her with this card when she got home. She loved the Tea and my card. LOVE yor cards! I can see why your mom loved the card! It's adorable! Your cards always make me want a Cuttlebug really bad, you use it so well! 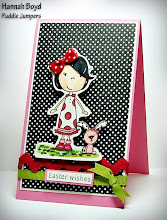 Darling cards, Hannah!! That was so sweet of you to have tea & card waiting for your Mom!! 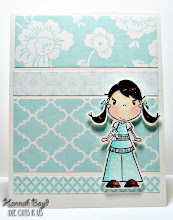 I just found your blog and this card is sooo adorable!! How sweet of you Hannah! I love your cards, your mom must be proud! Hey - I am really delighted to discover this. great job! 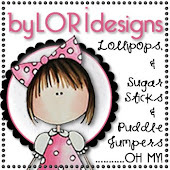 By LORi Designs Grand Opening! !